Such a beautiful card, Tracey! The white space around that beautiful branch certainly does give it a peaceful feel. I love the peaceful elegant simplicity of this card! Lovely! So pretty Tracey. Love the clean looks and the simple, but powerful greeting. That pine cone set has been on my wish list for ages. Love it! Lovely simplicity :) Wishing you a blessed Christmas Season! This is so clean and simple and wonderful, Tracey! I've really enjoyed being on this team with you -- wishing you all the best! What a beautiful way to say goodbye, Tracey. I'm so sad to see that curtain fall! This is beautifully elegant, Tracey! Thanks so much for coming back for the Farewell Challenge! Merry Christmas! Love the simple, beautiful statement your card makes! Merry Christmas! Absolutely gorgeous! Thanks so much for sharing and inspiring! Love that you came back to play with us Tracey. You know how much I love this CAS beauty! Beautiful and a perfect take on the inspiration. Great CAS card with just the right amount of glitter. Tracey. This is a lovely CAS card Tracey! That little strip of sparkle is perfect! 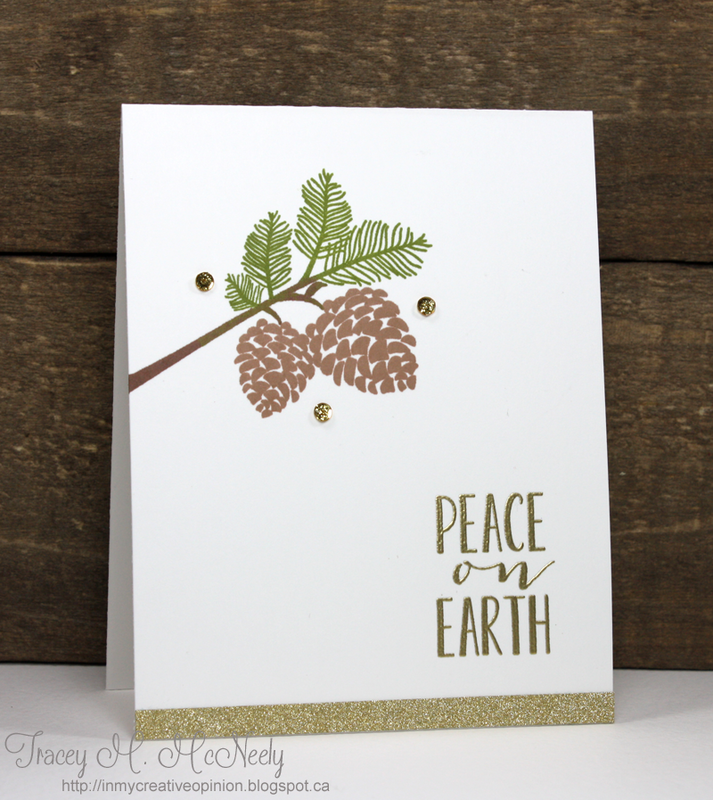 Simply beautiful card Tracey...love your gorgeous pinecones! This is really pretty, Tracey. I love pine cones. Lovely! Very nice, CAS, efficient card ! loving all the gold on this one! So pretty! I love this card! I love this inspiration photo. 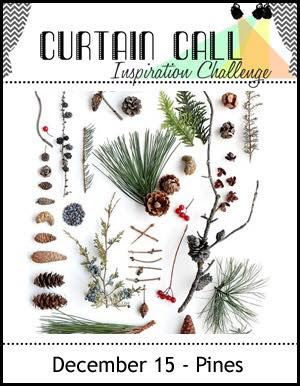 I'm so sad to see this challenge going...I miss having the time to play along. You are sending it off in a beautiful way, though. Such a lovely fresh and simple card! The simple pines and the pop of gold are perfect together. It was an honor being on the Curtain Call team with you! I love everything that you do and you will always be in my blog reader! Have a happy new year!